WASHINGTON (CNS) — Some of the children seemed fascinated with the life-size scene of Jesus on the cross. Some of the youngest wondered what was happening, why did people look so sad, they asked looking at the scene of Calvary. Others snapped pictures of a small holy water tank as their spiritual leader Venerable Sagarananda Tien showed one of the youngest campers how to put a donation in a box near the altar of St. Anthony at the Franciscan Monastery of the Holy Land in Washington. “Venerable” is a title of respect for ordained monks such as Tien. 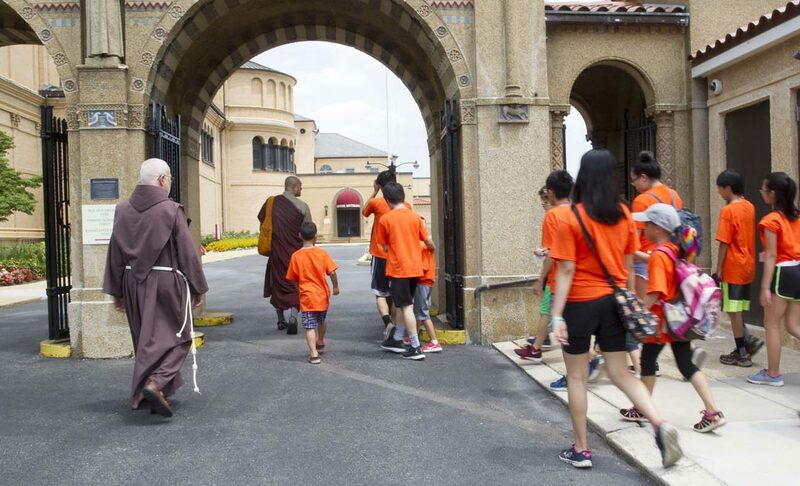 The group of more than 30 Buddhist children, ages 7 to 18, from the U.S. Zen Institute summer camp in Germantown, Maryland, visited the Franciscan Monastery July 12 to learn about Christianity, St. Francis and his followers. Franciscan Father Greg Friedman explained to them how some of the vegetables from the garden on the Washington property are given to the poor, how friars and other Franciscans care for places considered holy in Christianity, how St. Francis treated people, but also animals and creation, as a brother or sister. “St. Francis had a special place in his heart for the animals,” Venerable Tien also explained to the children. It was similar to what she believes, that “everyone is like a brother and sister, animals and humans,” said 9-year-old Malisa Nguyen during a tour of the monastery grounds. Venerable Tien and Father James Gardiner, a Franciscan Friar of the Atonement, are friends. The two said they had discussed the idea of hosting the children so they could learn about a variety of traditions, movements and cultures. “Nowadays, there is a lot of conflict and lack of understanding,” said Venerable Tien, who like Father Gardiner, works in interreligious circles, trying to foster understanding, respect, fellowship and unity. 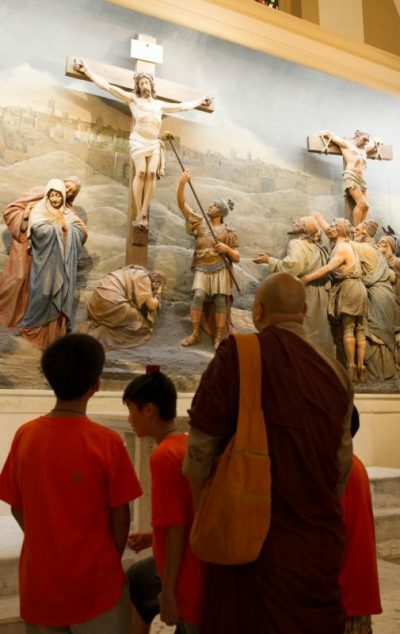 “It’s nice!” said 7-year-old Ethan Hsuan about the monastery that, with its replicas of various places holy to Christianity, such as the burial place of Jesus, a replica of the grotto in Lourdes, France, depictions of St. Francis and his love of creation, captured his attention. But for Malisa Nguyen, the Roman soldiers near Jesus on the cross made an impression and not a good one. Though many had some understanding of Christianity, they had more specific questions about Catholicism and the Franciscans. “Is your religion related to Vatican City?” one asked, during a question-and-answer period. Another camper asked the age of St. Francis when he died. The Franciscan friars fed them and briefly showed them around the grounds of the monastery, but some said they wanted to see more next time, and were happy to receive a plant as a parting gift. Venerable Tien said it was important that they hear about Christianity from those who practice it. Building bridges is the way forward.